Why Are Smoke Alarms So Important for Residential Fire Safety? Let’s check out the reasons why smoke alarms are so vital for ensuring residential fire safety. To many people, the answer to this question is self-evident. However, even with the importance of residential smoke alarms in mind, many people still don’t take the necessary precautions to verify that theirs is in working condition. Don’t take this essential piece of fire protection equipment for granted as it could make the difference between safety and extensive property damage and injury. Let’s check out the reasons why smoke alarms are so vital for ensuring residential fire safety. Your smoke alarm notifies you of any suspicious amounts of smoke in the air. It sounds an alarm alerting you to either respond to the emergency or immediately exit the building. The ideal situation is that this signal will allow you to react to the smoke before flames even begin to form. It’s important to have the appropriate number of alarms for the size and space of your home. The current recommendation is that homeowners should have one on each floor of the home, and outside each sleeping space. Logical placement is also critical, as having an alarm too close to a bathroom could cause unnecessary sounding as shower steam may activate the alarm. Teach all children in the home what it means if they ever hear the smoke alarm. Have a fire emergency plan in place that the children know and practice periodically. Establish a meeting place outside of the home that the children recognize and understand that is where the family will regroup. One of the most important factors of having a smoke alarm is ensuring that it is always working. Test your smoke alarm regularly, at least once a month. 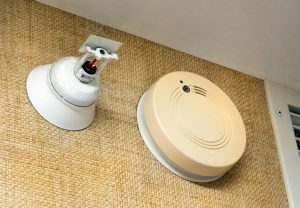 Most, if not all, models of smoke alarms come with a small button on the surface. All you must do to test it is push the button. You could also purchase a smoke alarm aerosol from your local hardware store. If you find that your smoke alarm requires any repair or replacement, then you should ask your family, friends, or neighbors about their recommendations for a trusted electrician that will be able to assess what your fire protection system needs. This entry was posted on Friday, January 26th, 2018 at 9:16 am. Both comments and pings are currently closed.